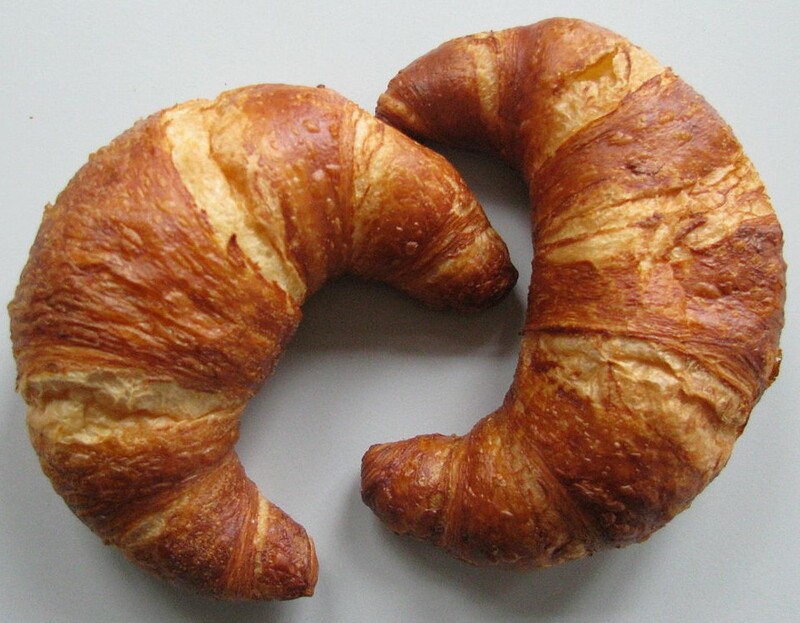 Kipfel, also called Laugencroissants, a popular variety of the French croissant in Southern Germany. Photo by Sundar1. A Kipfel, also called in German, Hörnchen. Photo by Hutschi. Mix together milk, yeast and 1 tsp sugar and set aside. Ensure it does not clump. Using a pastry knife, Mix flour, butter, salt in a bowl. Add 3-1/2 tbsp sugar and baking powder to the flour mixture. In a separate bowl, mix 3 egg yolks. Add the yeast mixture. Then add sour cream and vanilla. Mix the wet ingredients with the dry ingredients. Should have the consistency of peanut butter cookie dough. Add flour if sticky. Knead well and let stand 2 hours in a warm place. To allow the dough to rise, we place the bowl with the dough (covered with a tea towel) onto the top rack of our oven and place a bowl of hot water on the lower rack. Leave the oven off and it will gently warm and allow the dough to rise. Divide the dough into 5 equal sized balls. Sprinkle sugar on a board, put a dough ball on the board, and roll out into a circle about 12 inches across. Flip the dough over and put more sugar on the board. Cut like a pizza into wedges about 1-1/2 inches at widest. Put filling on each wedge (about 1 tsp each) and roll in sugar, poppy seeds, salt or leave it plain. Bake on a cookie sheet at 325 F for 15 min until golden brown. 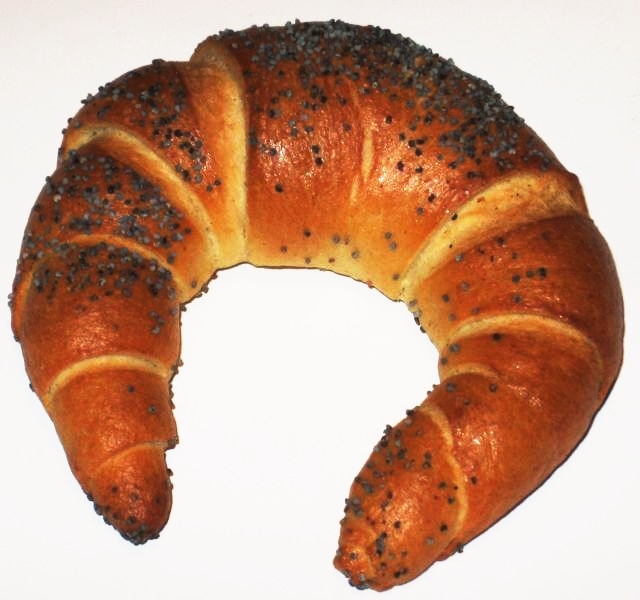 Kipfel with poppy-seed sprinkled on top. Each nationality calls them differently. Filling can be walnut filling, jam, butter etc. This recipe makes 60-80 Kifli. 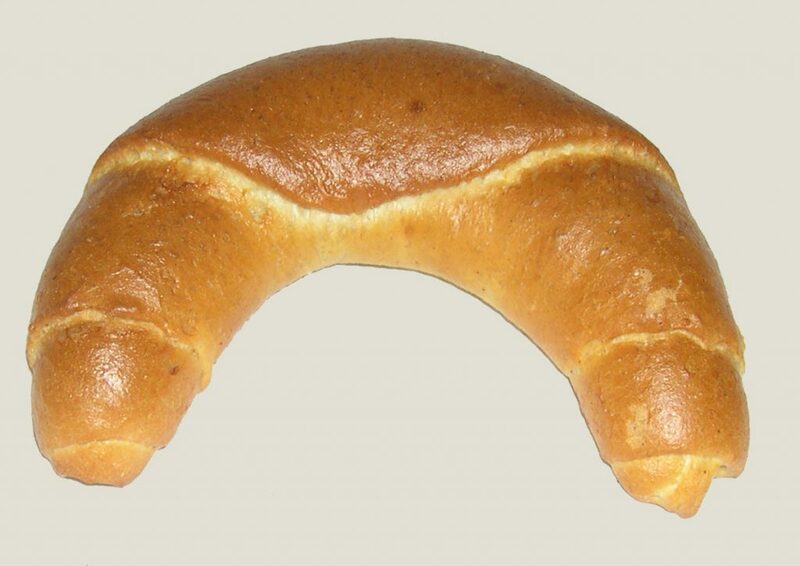 Kifli Crescents are the Hungarian name for these crescents .